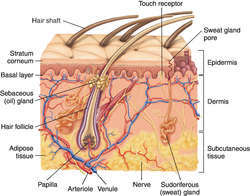 Critical care Any synthetic material designed to have the physicochemical properties of skin–eg, optimal 'wetting' and 'draping,' leading to adherence, ↓ bacterial invasion and fluid loss, eliciting cellular and vascular invasion, synthesizing a dermal matrix while biodegrading the artificial graft. See Burns, Dermagraft-TC, Integra Artificial Skin. Cf Split-thickness graft, Spray-on-skin.